What is is about buns? Or, more precisely about bun dough? Christmas bread, Easter bread, other festival, celebration, and holiday bread - it's all more or less made of the same thing - bun dough. 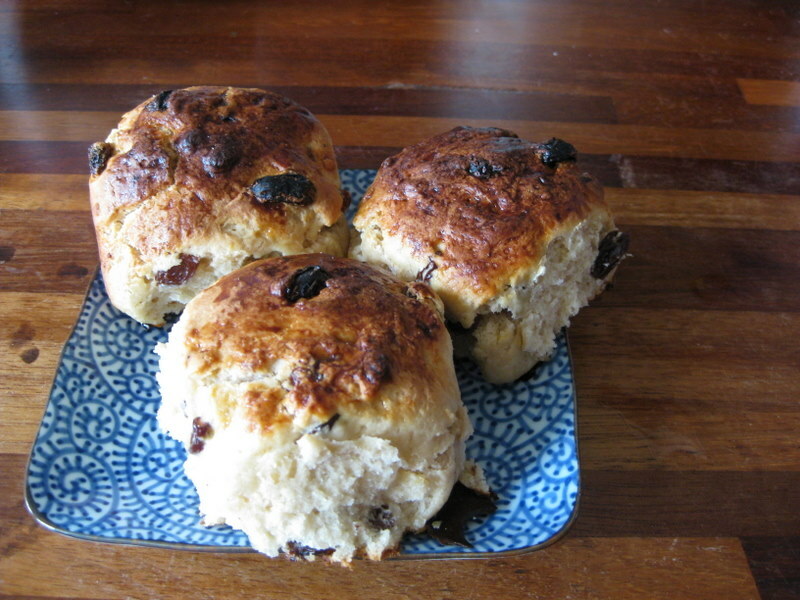 The English are particularly good at buns: Chelsea buns, Sally Lunns, rock cakes, bath buns - it's all going on and yet we don't seem to eat so many buns any more. Somehow we started eating cup cakes instead or horrible muffins from coffee chains. Yet buns are fantastic and, if made with good flour and prepared properly, they are are reasonably healthy treat. I do stress the word treat, though. Buns are not bread so they are not for daily consumption. However for a special afternoon tea you cannot beat a good bun. How do you make buns? Bun dough is bread dough that his enriched with goodies. The goodies will include milk, butter, and sugar. The goodies may include eggs, fruit, nuts, and spices. All celebration or festival bread is made out of a variation of bun dough. This is a recipe for one kind of bun, using a very standard and only slightly enriched bun dough, raisins, and some grated lemon zest for springiness, I am certain this will not disappoint. In a big bowl, whisk the yeast, 50 sugar and warm water together. Let sit for 10-15 minutes or until the yeast is foamy. Add 250 g flour, the rest of the sugar and the warm milk and stir it in well. Cover and let sit for one hour. It will foam up and collapse back again. Add the rest of the flour, salt, lemon rind and melted butter. Knead for 10 minutes and then put back in the bowl and cover. Let rest for 15 minutes and then fold in the raisins. Put it back in the bowl and let it sit, covered for 1-2 hours. It should double in size. Take the dough out and divide into 12 equal pieces. Roll each piece into a ball and place snugly in a small baking tray so that they are touching. Cover and leave for 1 hour. Put the oven on to 220 degrees C.
5. Beat the egg yolk with a teaspoon of water and then brush over the buns. 6. Bake the buns for 20-25 minutes (they should sound hollow when tapped) and then let cool completely before eating. I prefer them covered lavishly in butter and eaten with a cup of tea.